Just a recipe today folks, as we’re having a lazy day in front of Netflix. We literally could not have done less today – we stayed in bed until 10am, got up, took the duvet with us and got under it on the sofa and have barely moved since. Paul went for a piss sometime after noon and I’ve made a few cups of tea, but put it this way, if we had a pedometer attached to one of our flabrolls, it would read ‘ERR’ right now. Ah well. We work hard, we can rest! It’s lucky that neither of us are the type to look with jealous eyes at other people on Facebook who are out protesting, or burning in the sun, or rolling down hills in plastic balls. I mean, yes, that’s fun, but it’s so energetic. We like to rest before we get tired. it’s not going to be full of awful people who think a SKOL ashtray and a STELLA umbrella is the sign of a fine establishment, although, the other side of that coin is that it’s bound to be full of hipsters photographing the Northern Lights and saying yah-but-really-though all the time. So: if you’re a fan of our previous travels to Ireland or Germany, you’ll enjoy hearing us battle our way through the customs and traditions of Iceland. 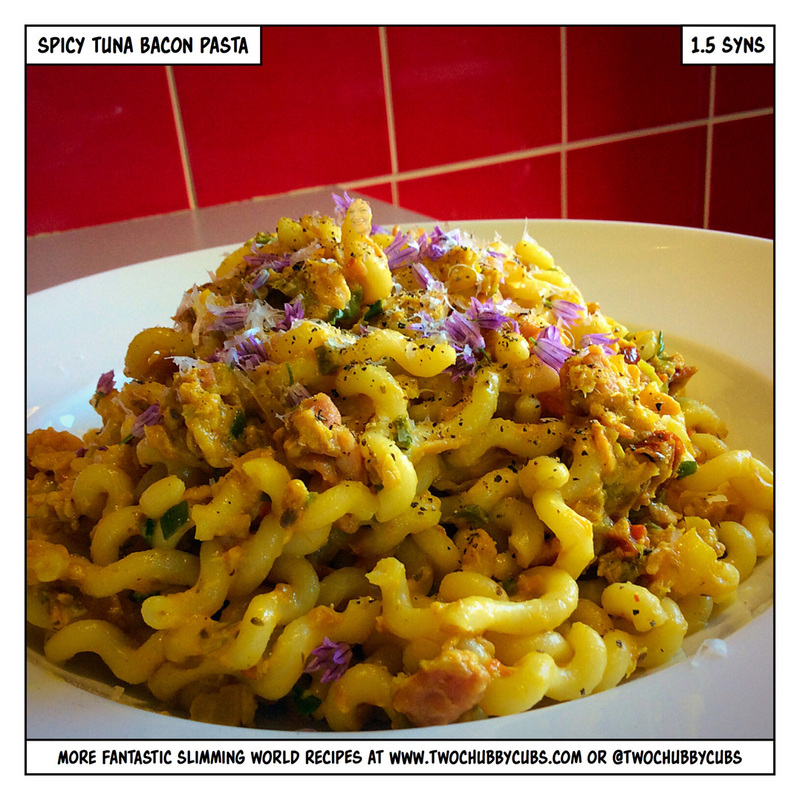 Anyway: tonight’s recipe, before I pass out through sheer exhaustion, is a spicy tuna and bacon pasta. drop of two of oil, or Frylight, for all your pan-ruining needs! ← don’t light a match, it’s egg curry time! Kitchen looks like a bomb hit it but meal was delicious! Thanks guys. Made this today, tasted delicious. I think that it will equally serve cold, as a salad.my thoughts are that if I did it again, I might half the pasta and it would then be more of a meal for one. I personally found that too much pasta diluted the taste. Definitely will be making it again. Just joined Slimming World last Wednesday and finding the food bit fine because I eat a healthy diet anyway but I am finding it difficult to cut down on my alcohol intake which is why I’ve put weight on! I have really enjoyed reading your blog which has kept me very amused all Sunday afternoon. Any tips or advice on how to limit my alcohol intake gratefully needed. Yes I know it’s willpower and have to change my habit but finding it hard as I know it’s a prop for feeling low.